Isiah Factor | The Insite » CONN’S SETTLES CLAIMS OF QUESTIONABLE BUSINESS PRACTICES WITH THE ATTORNEY GENERAL! CONN’S SETTLES CLAIMS OF QUESTIONABLE BUSINESS PRACTICES WITH THE ATTORNEY GENERAL! 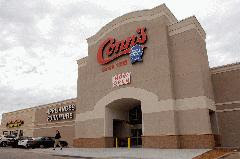 November 24, 2009 | Posted in Uncategorized | Comments Off on CONN’S SETTLES CLAIMS OF QUESTIONABLE BUSINESS PRACTICES WITH THE ATTORNEY GENERAL! THE COMPANY IS COUGHING UP $4.5 MILLION TO MAKE IT GO AWAY! Press Release: Texas Attorney General Greg Abbott today resolved the states enforcement action against Conns, Inc. In May, Conns was charged with failing to honor product warranties, misleading customers about the nature of its products, false advertising and other violations of the Texas Deceptive Trade Practices Act. According to the states enforcement action – and information contained in more than 3,500 customer complaints – the defendant unlawfully relied on aggressive and deceptive sales tactics to increase its extended service warranty sales for appliances, electronics and other products. The agreement reached today requires Conns to reform its business practices and pay $4.5 million in restitution for its customers. Just in time for the holiday shopping season, todays agreement fundamentally reforms how Conns does business, Attorney General Abbott said. Under its agreement with the state, Conns must remedy its high pressure sales tactics, refrain from misleading customers about extended warranties, and fully honor the warranty agreements that it sells to customers. By redressing of improper conduct and setting aside restitution, this agreement benefits past, present and future Conns customers. According to state investigators, Conns instructed sales personnel to rely on high-pressure tactics to overcome objections voiced by customers who declined to purchase extended warranties. The states May enforcement action also indicated that Conns failed to provide customers with a copy of the warranty agreement at the time of sale. As a result, purchasers were not adequately informed about exclusions, limitations, cancellation penalties and other provisions governing their warranty agreements. In an agreement reached today, Conns agreed to provide customers a copy of the extended warranty agreement at the time of sale. Conns also must ensure that its sales personnel accurately represent rights, remedies or obligations contained in the extended warranty agreements. Under todays agreement, Conns must also refrain from adding extended warranty or credit insurance products to customers invoices without their written consent. Extended warranty agreement provisions will protect existing customers because the agreement applies to both existing and future extended warranties. The states May enforcement action charged Conns with failing to fulfill its warranty obligations. According to customer complaints obtained by the Office of the Attorney General, Conns delayed repair appointments for weeks or even months, failed to repair items to working condition, ignored calls, and ultimately, refused to give refunds or replace the defective products. Todays agreement stipulates if a product fails within 72 hours of purchase or delivery to a customers home, Conns must replace the product with an identical or similar model. If the product fails at the time of delivery, the Conns delivery team must remove the product and exchange it. Finally, the agreement requires Conns to compensate customers who were harmed by its unlawful content. As a result, Conns must pay $4.5 million to establish a customer restitution fund. Todays agreement also requires Conns to pay $250,000 in attorneys fees and $100,000 to the University of Houston Consumer Law Clinic. In the coming weeks, the Office of the Attorney General will review customer complaints and other data to determine how it will administer the restitution fund. Customers with questions should call (800) 252-8011 or visit the attorney generals Web site at www.texasattorneygeneral.gov.